Combine cider, brandy, brown sugar, lemon juice, salt, sage, rosemary, peppercorns, mustard and bay leaves in large nonmetallic container; stir until brown sugar is dissolved. Remove neck and giblets from body and neck cavities of turkey. Refrigerate for another use or discard. Pat turkey dry with paper towels. Place turkey, breast side down, in marinade. Cover; refrigerate 6 to 8 hours, turning turkey over occasionally. Preheat oven to 325°F. Remove turkey from marinade; pat dry with paper towels. Turn wings back to hold neck skin against back of turkey. Return legs to the tucked position, if untucked. Place turkey, breast side up, on flat rack in shallow roasting pan; coat with cooking spray. Roast turkey 1½ hours. Then, cover breast and top of drumsticks loosely with foil to prevent overcooking. 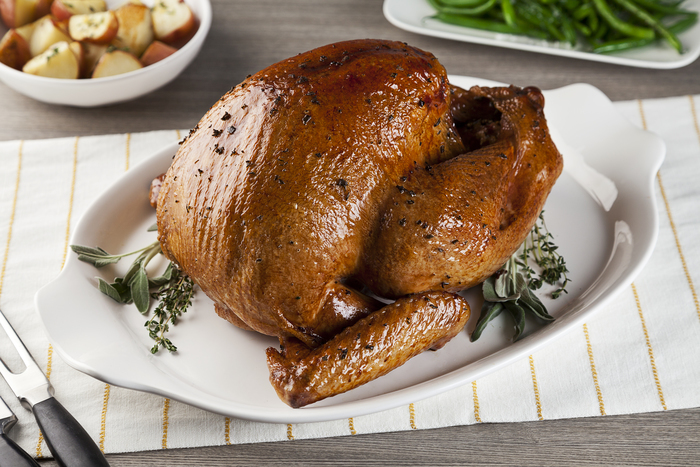 Continue roasting turkey 1½ to 2 hours* or until meat thermometer reaches 180(o)F when inserted into deepest part of thigh not touching bone. *Follow cooking times according to package directions; times vary with size of turkey. Transfer turkey to cutting board; loosely tent with foil. Let stand 15 minutes before carving.